At some point in motherhood every woman is smacked right in the cheek with that inescapable truth that we all hate. It's something old ladies in the grocery store have warned us about for years, something our mothers have always told us, but it doesn't become such a reality until sometime after you have them in your home. they were not made to be held on to. Thankfully, I think back to my own life (and mom, you can stop crying now) because I realize that there is surely some portion of me that will always need my own mother. Advice, comfort, knowing that when I'm sad, discouraged or confused she has some God-given power to know me well enough to deliver exactly what I need to hear (even if it's "get over yourself" and it often is). And while I don't think you ever get over the fact that your baby is not a baby...(or a toddler, or a kindergartner, or even a high schooler.....well, scratch the last one), we can at least find comfort in knowing we are always pointing them to the one thing that all of us can (and should) hold on to at all phases of life and with such intensity that we refuse to let go... and that is God. The One who knows better than all else how hard it is to let go of a child. 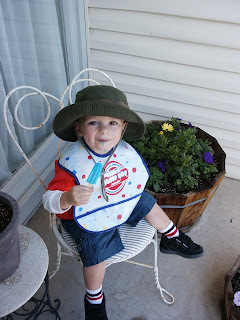 is he not the sweetest little popsicle eater, or what? What a great story. Loved it. A Mother's work is NEVER done. Or as a wise woman once told me, "You will always be needed Mom". P.S. Thanks for making me cry like a baby at work! I don't think it takes much mama!